Once called "that villain Moody" by George Washington himself, and "the best Partizan we had," by William Franklin, the Loyalist governor of New Jersey, Moody risked his life recruiting, gathering intelligence, and freeing prisoners behind American lines. Next came dispossession and exile in London, where he strove to obtain British recognition of his losses, and wrote the objective, exciting account of his fateful choice, and the exploits that inspired this book. 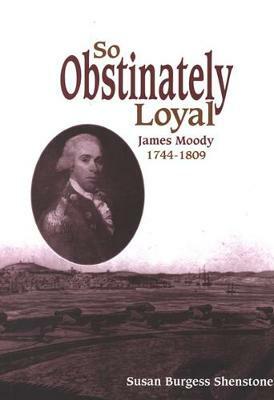 So Obstinately Loyal culminates in Weymouth, Nova Scotia, where, along with almost 40,000 other Loyalists, Moody had to remake a life among the Acadians and earlier Yankee settlers. His complex career encompassed ship-building, efforts to found an Anglican parish, military service as an officer in a regiment formed to defend against invasion from revolutionary France, and building on his American experience to work for constitutional reform. Moody's life was shaped by the growing pains of fledgling nationhood on both sides of the border. Yet he and people like him also helped to shape the destinies of nations. This complex weave of precarious existence and nation-building, of adaptation and "staking one's all," emerges clearly from Susan Shenstones's meticulous research and vivid writing.